The cute couple was spotted kissing during a date night in California last month (Aug16), but they only just confirmed their relationship by sharing a sweet Instagram snap on Tuesday (06Sep16), and in a new interview, Mac reveals they fell in love while recording music together. "We hung out for a long time and everything just happened organically," he explains to People magazine. "We love making music together - we do that always. But she's my best friend in the world." 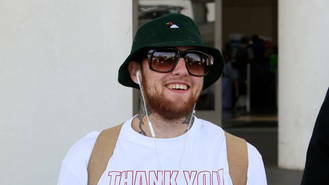 The musicians most recently collaborated on the track My Favorite Part, which appears on the rapper's fourth album, The Divine Feminine, and Mac admits he didn't have Ariana in mind while he was writing his romantic new tune. "I wrote that love song before I saw her," he explains. "We made that song and started becoming close again. It's very dope and I like how that worked out." "It was great," he adds of their recording experience. "There was no awkwardness or weirdness, it was how it always was. Just both of us older, more mature and more sure of ourselves. When we first recorded together we were young and figuring it out, which we still are, but now seeing her growth and my growth - it's great." Although their romance came about as a bit of a surprise to Mac, he is so proud to call Ariana his girlfriend. "She's just very warm and comforting," he gushes. "She's very caring but, also, we have a lot of fun. We go on adventures. Adventures can be driving around in the car aimlessly. It's great to be able to do nothing and be doing so much."